Known as Le Celle, this Franciscan hermitage is just five kilometres from Cortona at the feet of Mount Sant’Egidio. In 1211 St Francis along with a few of his followers built the first nine cells of the hermitage and the place has taken the name of Celle ever since. Before their arrival there were only a few small hermit’s cottages and peasant dwellings, along with a small chapel that had been built during the Longobard invasions and dedicated to the Archangel Michael. This is believed to be the place where, in May 1226, four months before his death, St Francis dictated his Will. Following the death of the saint in Assisi, in October of the same year, Brother Elia withdrew permanently to the Le Celle hermitage in 1239 and carried out a number of improvements and restoration works that ensured the hermitage became a Franciscan property in every right. Brother Elia is in fact considered responsible for having broken up the stone of the caves and created a chapel that was formerly used as a dormitory by the monks. Behind there is the small cell where St Francis lived. 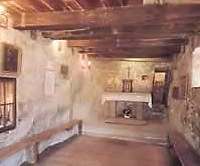 The walls built under Brother Elia are rough but solid, and the hermitage contains eight small rooms large enough for a bed, a table and a chair – the essential furnishings prescribed by St Francis himself for a Franciscan hermitage, where the prime importance was to lead a life given over to contemplation. After Brother Elia’s death in Cortona in 1253, the Franciscan order fell into a complicated series of internal divisions. The hermitage was occupied by a community of "Spirituali", or "Fraticelli", until they were banished in 1363 after suffering excomunication from Pope John Giovanni XXII. Le Celle stood abandoned until 1537, when it was granted by the Bishop of Cortona to the recdently founded Third Order of Franciscans, known as the Capucins. The hermitage was considerably enlarged by the Capucins, who in 1634 erected a new chapel to take the place of the ancient chapel dedicated to St Michael. This new chapel was consecrated to St Anthony of Padua and reflects the simple, unpretentious architectural and decorative style of the Capucins. Unadorned by works of art, the chapel still has wooden altars. Board: The convent is able to offer lodgings to those contemplating a vocational life and who are willing to take part in all of the community’s activities. Near the convent there are some 40 bed spaces available in houses for independent groups of visitors. Spiritual retreat: Le Celle is able to offer a period of solitary prayer to priests for a minimum period of one week and lasting up to a month if necessary. This facility is availablee in a small hermitage above the convent itself. For further information access the websitewww.lecelle.it.